november 2008 | 504 blz. This study is devoted to answering the question whether the international community now has the necessary tools at its disposal to respond effectively to the issue of statelessness. 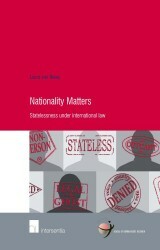 It investigates in detail both the (enduring) value of the two tailor-made statelessness conventions, as well as ascertaining what other areas of international law – in particular human rights law – have to offer in answer to the phenomenon of statelessness.